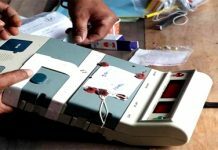 Diamond Harbour: Voting for the by-poll in Maheshtala Assembly constituency in South 24-Parganas has ended without any major incident of violence or irregularities. The voting started at 7 this morning with heavy deployment of Central and state forces. To ward off violence, the Election Commission of India deployed as many as 10 companies of the Central troops. As a result of this, barring one or two incidents of BJP agents being driven out allegedly by Trinamool cadres or malfunctioning of EVMs in some polling booths, the voting went on peacefully till the official deadline 6.30 pm. Till 5 pm, the voter turnout stood at 70.01 per cent as against the total eligible voters of 2.48-lakh. The counting of votes is scheduled on 31 May. 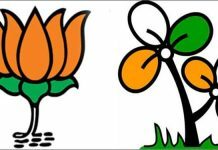 The by-poll was necessitated by the untimely death of Trinamool MLA Kasturi Das, who passed away on 23 February. 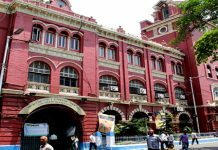 Das, the mother-in-law of Kolkata Mayor Sovan Chatterjee, was a two-time MLA from Maheshtala. In the by-poll, Trinamool has fielded her widower and Maheshtala Municipality’s chairman Dulal Das. BJP candidate is former IPS officer Sujit Ghosh while, from CPI-M is in the fray is Prabhat Choudhury.